It's true and unfortunate that many people fail these exams. Most of the time it's because they weren't prepared. The questions on the test are real world and geared toward an industry standard. The answers were not what they expected. The good news is it's mostly common sense and most people fail by only a few questions. Amazing! If you improve your score by a few questions, you pass. We suggest you study. Start with a detailed ASE certification study guide in the menu section or take a quick 20 question ASE practice test below. View this 10 question ASE A5 Video with illustrated answers. These videos are designed to improve user retention. Grab some study time on any device! ASE A1-A8 Study Guide - Plus the G1! 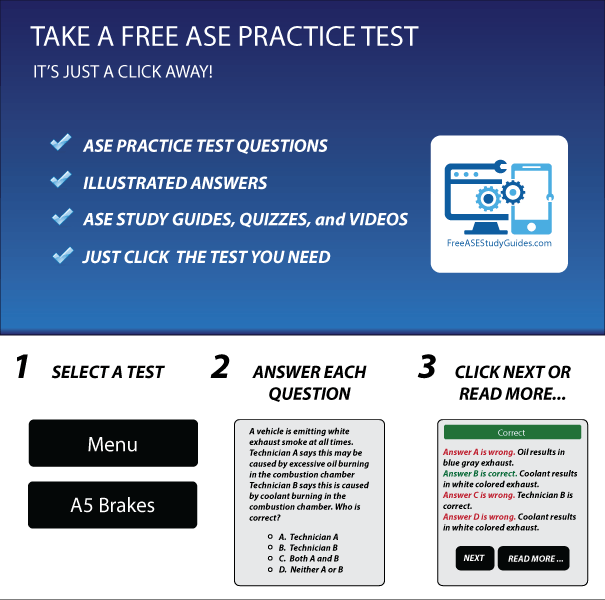 Eight (A-series) ASE practice tests designed by ASE Master Technicians and created by certified automotive professionals who have been taking these tests for years and know what to expect. It has free ASE test prep for the ASE A1 through A8 certification exams. It also contains a practice test with detailed explanations for the G1 Maintenance and Light Repair test. Use the Read more... section for even greater impact. They're designed to help automotive professionals prepare for the upcoming ASE testing season. ASE testing is now available all 12 months of the year. Plus there's a full 90 days to prepare, register and take your test. Sign up for MyASE. This will keep you informed of any new or upcoming ASE certification tests provided by ASE. They also provide a history of ASE certification tests taken in the past.